Join this week to take time to completely relax your body and mind. To rediscover your true self on an inspiring yoga holiday in this wonderful nature reserve Costa Vicentina in the Algarve, Portugal. 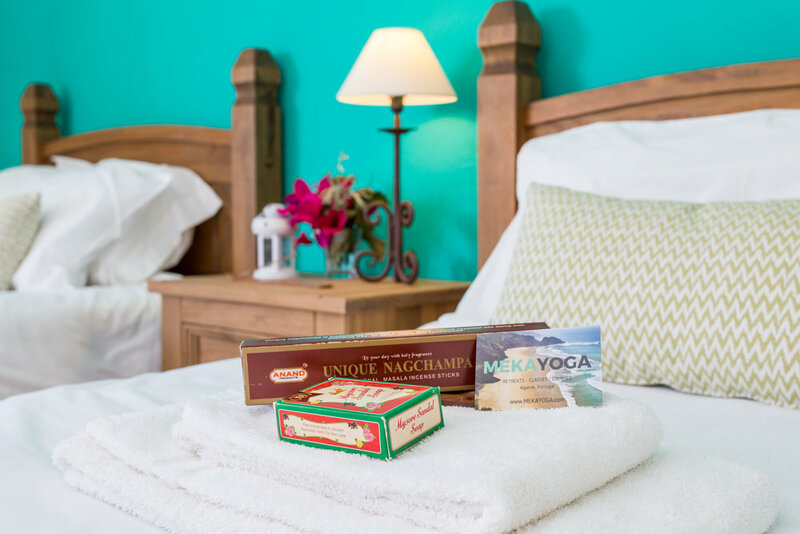 Regain your physical and mental strength with dynamic morning yoga practice, relaxing afternoon sessions, guided meditations and evenings and mornings with Noble Silence. Learn to cultivate inner-peace and reconnect with nature in this magical landscape, enjoy delicious healthy organic food and meet like-minded people from all over the world. Of course you will have plenty of time to experience the wonderful nature, beaches, hike, bike, surf, or just read your book in the shade of our orange trees, and enjoy our swimming pool. Morning and afternoon yoga classes from professional, passionate teachers, combined with talks to increase your understanding of Yoga and to understand the functioning of your own body and mind. Heaps of time to discover the wonderful National Park Costa Vicentina while hiking along the cliffs, or to read your book under the orange trees next to the pool in our garden. Book an afternoon surf lesson, meet like-minded people, go for a silent meditation walk. Just breathe and feel the sun on your skin... and feel healthy and energized with delicious wholesome food. You will be staying in our quiet Yoga Villa, outside the picturesque fisherman village Vila do Bispo, right in the National Park Costa Vicentina and just 3km from the most astonishing unspoiled beaches along the Atlantic Ocean. 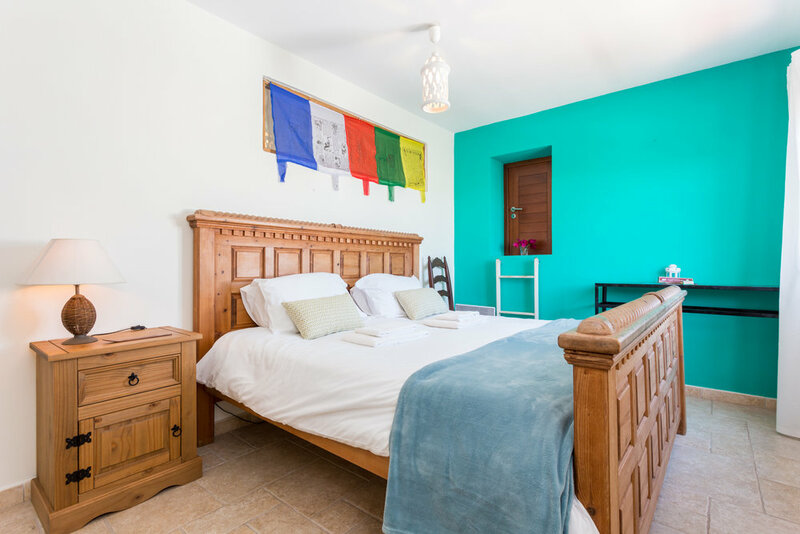 The yoga villa has 4 double/twin/triple rooms (all with private bathroom), a comfortable living and dining room, rooftop terraces, a large swimming pool, and a 50 m2 wooden yoga deck under the orange trees in our garden. From the backyard you walk straight into the National Park Costa Vicentina where many wonderful trails take you towards the Algarve's most beautiful beaches. * Program may vary depending on season and weather conditions. Any requests? Let us know! 3 yummie healthy meals a day, fresh from the farmers' market and mostly gluten free, vegan and organic. "You are what you eat" and therefore we want you to eat healthy, happy food that is prepared with love. All food is vegetarian, mostly vegan, as much as possible organic and from the local farmers' market. Breakfast, lunch and dinner are included and prepared by our lovely chef. Doing some KarmaYoga in the kitchen by giving a helping hand is very much appreciated and a great chance to learn some delicious healthy yogic dishes. Fresh fruit and herbal teas are always available. * Example Day: Enjoy a nutritious bowl of oatmeal porridge prepared with rice milk, soaked almonds, dried figs and local honey to restore your energy after the morning yoga session; get your vitamins and proteins with a fresh quinoa-lentil-sugarsnap salad decorated with delicious ripe mango and warm your body after the evening yoga with a beetroot soup dressed with fresh coriander and roasted pine nuts, served with rye bread and freshly made humus for the hungry ones. Diana was born and grew up in the South of Portugal. It didn't take her much time to realize that yoga was an essential part of her life and is dedicated to share her knowledge and passion with the rest of the world. Her approach has the main focus on breath working, body awareness and deep relaxation of body and mind. Diana is 400hr Yoga Alliance Certified teacher with a focus on Hatha, Yin, Pranayama and Meditation. Michaël is a passionate yoga teacher that has developed his own way of teaching over the years. He teaches yoga in the style of Iyengar yoga, Shivananda Hatha yoga and integrates many mindfulness exercises in his sessions combined with QiGong. Michaël also studied at the Paramanand Institute of Yoga Science & Research in Indore, India. Michaël is 800hr Yoga Alliance Certified teacher with Yoga Therapy Certification. Want to be the first to get special discounts, new dates and other updates? Leave us your email address so we can stay in touch!